How a BK prosthesis fits depends primarily on the form of the socket. Control, wearing comfort and adhesion are determined by the plaster impression. 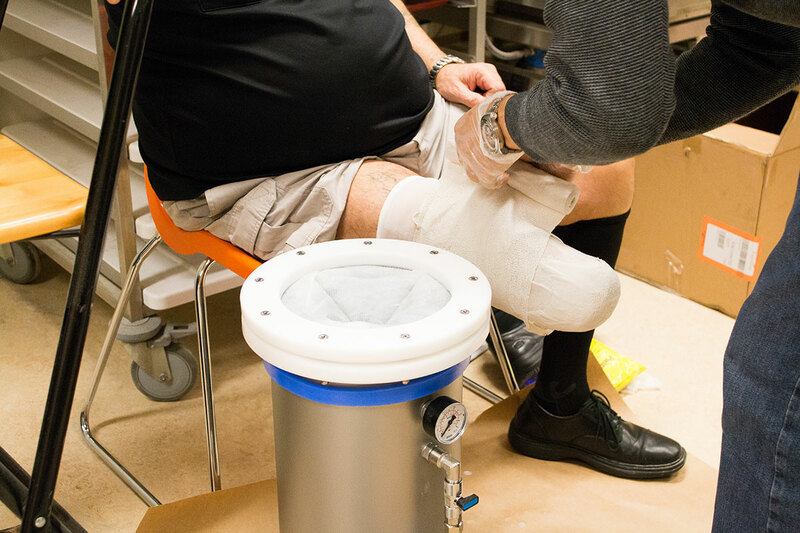 For the first time, the Symphonie Aqua System makes it possible to determine the stump’s burden within the prosthetic under actual conditions, and to produce a properly fitting plaster impression while the lower extremity is bearing full weight. When applying this technology, optimal hydrostatic pressure takes place, allowing the individual body weight a perfectly even transfer onto the stump while making the plaster impression. The residual limb shape determines the socket form. The full contact provides a better proprioception. Consequently, the plaster impression is already able to provide realistic image of the tissue and the bony structures. At this point, the patient can give you valuable information concerning the volume of the socket and the bony part of the stump. The degree of compression reached on the stump by plaster model by approximately 2.5 %. When making the plaster impression, the patient is already able to burden the stump with his/her entire body weight. 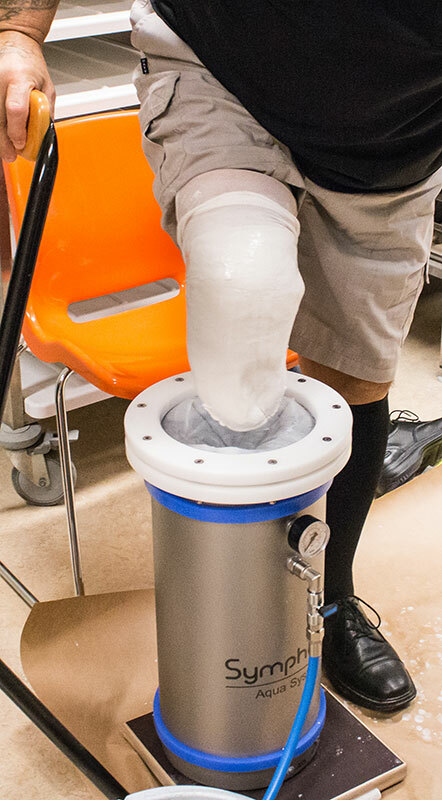 Under full load, the hydrostatic pressure in the cylinder counteracts the patient’s body weight and compresses the stumps’s surface. Consequently, a total surface weight bearing of the stump surface has been achieved. Reproducibility of the impression accelerates and simplifies the care situation. Comprehensive model modification and extensive try-ons are no longer necessary. The time saved here positively effects economic efficiency. The plaster impression formed while under hydrostatic pressure (total surface weight bearing) offers the patient and technician the possibility of registering and describing existing pressure situations. Before the socket is produces, factors such as prevailing pressure ratios, pressure points – as well as soft tissue situations in the socket – already become apparent, thus making individual provisions possible. Consequently, before the model is even created, the orthopedic technician already knows which feedback the patient will give in response to the socket. While bearing a full load, scarred, sensitive areas and prominent locations on the bone are clearly recognized. Likewise, this new procedure enables assessment of the stump situation under close consideration of the body weight and the resulting compression.